Popular culture has its fair share of grandiose depictions when it comes to the realm of dinosaurs. But this time around on the academic side of affairs, the sense of fascination rather traverses the size-factor, to account for something more intricate. The result is the discovery of two dinosaur wings that are so well preserved inside amber that the researchers could even discern the feathers on their forms. The scope becomes even more impressive considering the wings are dated from around 99 million years before. The organism in question here actually pertains to the Enantiornithes, a group of extinct avialans (from the clade Dinosauria) who retained some features of their dinosaur cousins, like emerging teeth from inside their beaks and tiny clawed fingers on each wing. However other than such ‘anachronistic’ features, the creatures resembled modern birds from the external perspective. Now on the fortuitous side, two such Enantiornithes wing specimens from the Mesozoic Era got trapped in some tree sap occurring in present-day Myanmar. The sap in turn morphed into amber over the long period of time, by a process known as molecular polymerization. The biggest problem we face with feathers in amber is that we usually get small fragments or isolated feathers, and we’re never quite sure who produced [them]. We don’t get something like this. It’s mind-blowingly cool. Interestingly, one of the wing specimens is affectionately given the moniker of ‘Angel’ because a jewelry designer (on discovering the amber) apparently wanted to remodel it into a pendant and christen the item Angel’s Wings. But of course, fortunately enough, the researchers were able to properly identify the dinosaur wings and the associated feathers just in time, thus stopping the rare natural object’s undeserving commercial journey. 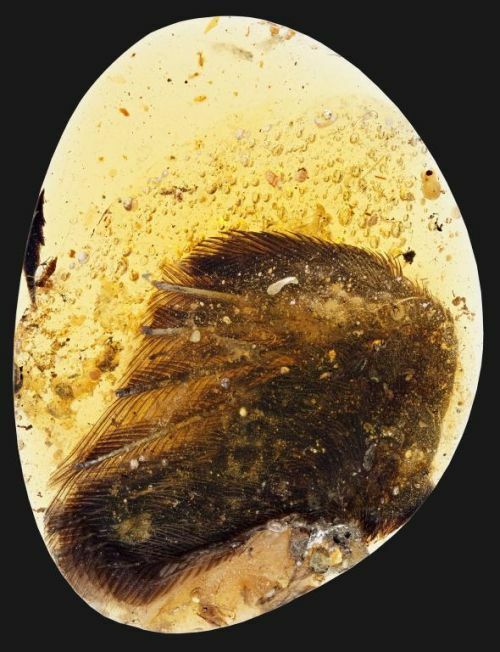 When the researchers analyzed the fossil, they observed truncated wing surfaces directly on the amber surface that suggested it had been chipped off of a larger amber inclusion that may have originally included the entire early bird specimen. 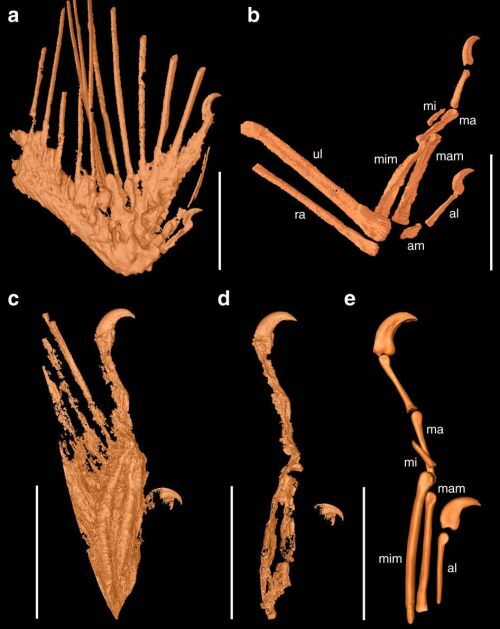 Still, what Xing [study co-author Lida Xing of the China University of Geosciences] saw in the micro-CT analysis made his heart race, he recalls: not just single feathers, but multiple feathers associated with the bony structure of an almost 100-million-year-old wing. 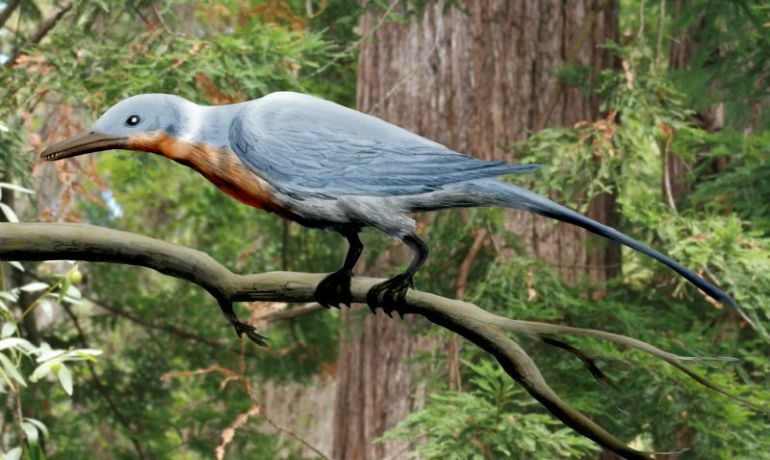 Reconstruction of Shanweiniao cooperorum – genus of long-snouted enantiornithine birds.